Jüterbog: A small city of roughly 14,000 inhabitants some 90 kilometers southwest of Berlin. It’s a city you won’t read about in travel books despite its well-preserved medieval city center, which suffered no considerable damage during World War II. 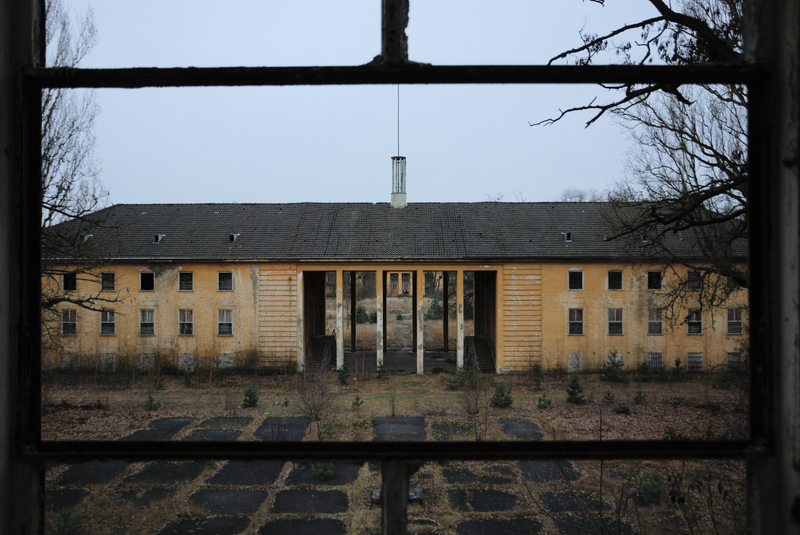 There is, however, a different side to the city: Jüterbog was one of the most important military garrison towns of the German Empire, Nazi Germany, and later the Soviet Union. 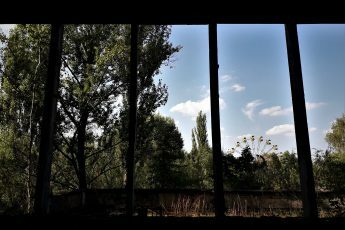 The soldiers left in 1994, leaving behind a number of military facilities ranging from simple barracks to even a small airport—all of which have been decaying into oblivion ever since. 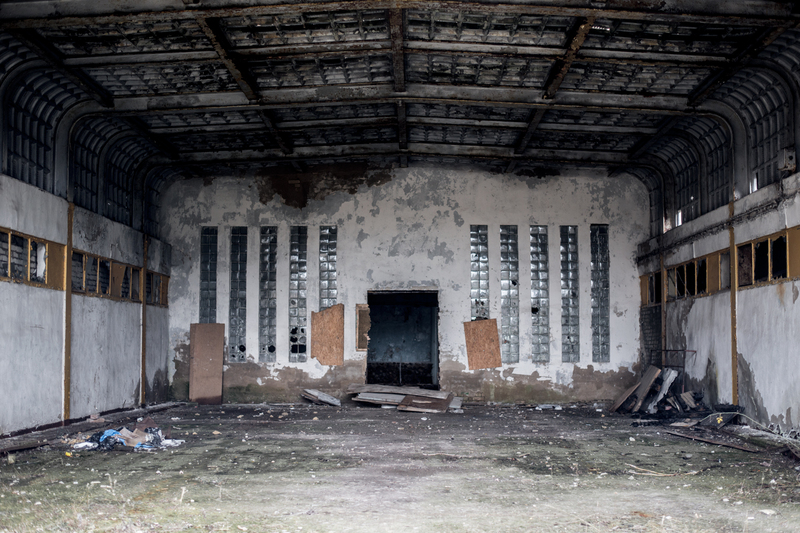 I wanted to witness the desolation with my own eyes, so earlier this month I headed to Jüterbog my friends (and very talented photographers) Mike and Ruben—who shot all the pictures featured in this article. 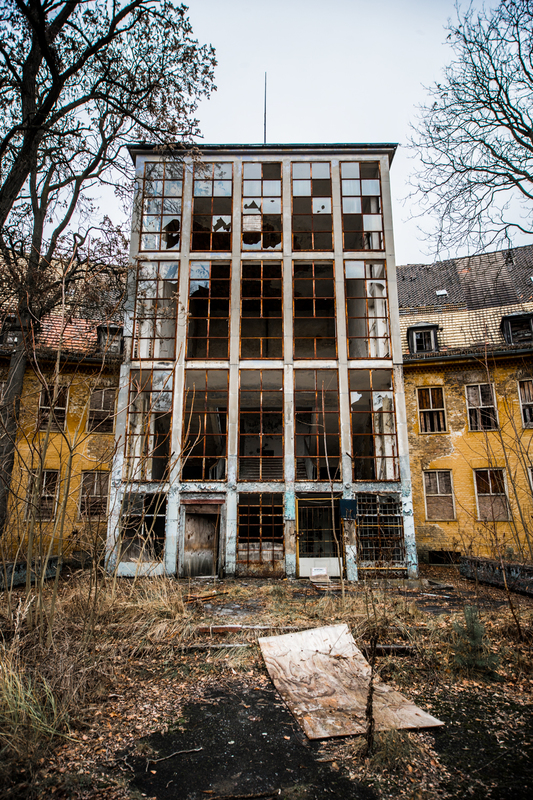 How did Jüterbog become home to over 30,000 Soviet soldiers? In order to answer that question we’ve got to go back in time a bit. The German Imperial army established several garrisons around Berlin in the late 19th century, for example in Zossen, Wünsdorf, and Jüterbog. After the demise of the German Empire, these bases remained in use by the armies of both the Weimar Republic and the Third Reich—its successor states. 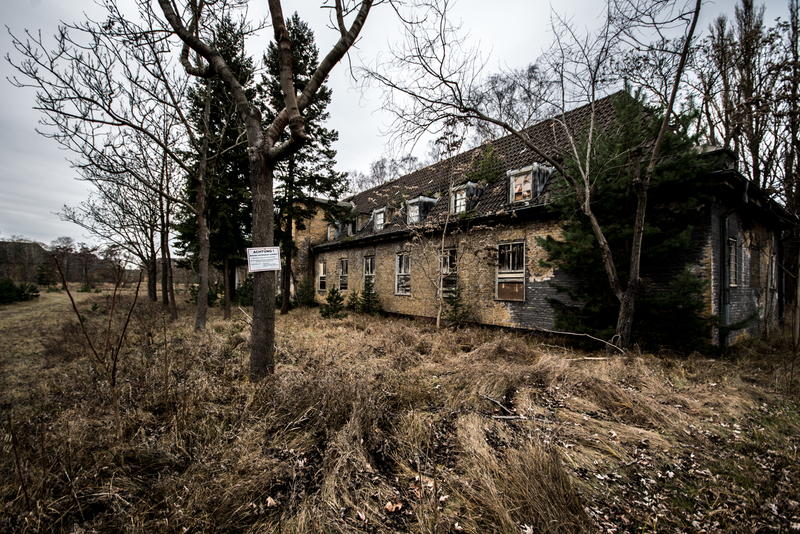 The Nazis greatly expanded the facilities in Jüterbog, establishing the Adolf Hitler barracks in the middle of the Zinna forest, which is just outside of the city halfway to Luckenwalde. It was not, however, until after World War Two that Jüterbog acquired more significance: Following the defeat of National Socialism, the Soviet Union occupied the eastern part of Germany—which on October 7, 1949, officially became the German Democratic Republic, or East Germany. 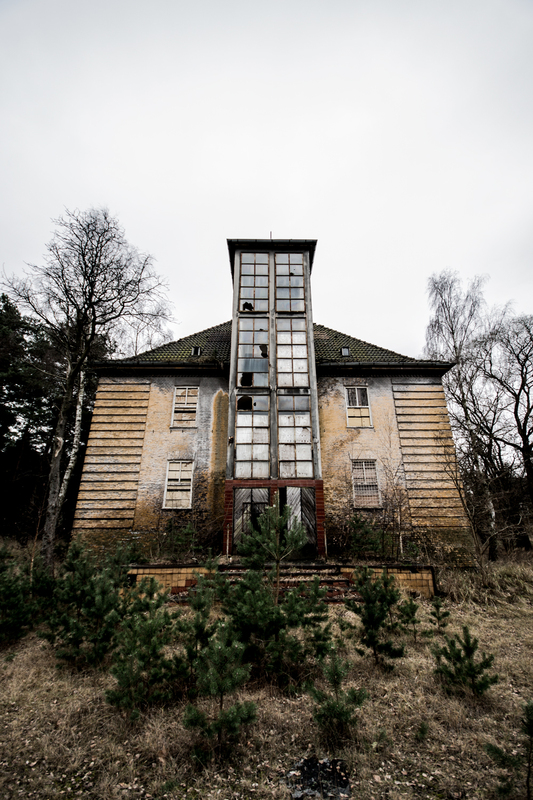 Just like in its other satellite states, the Soviet military machine set up shop in East Germany, taking over former-Nazi bases for their own use—which is nothing the Allies in the West didn’t do, by the way. The Soviet troops stationed in Germany were collectively known as Group of Soviet Forces in Germany. 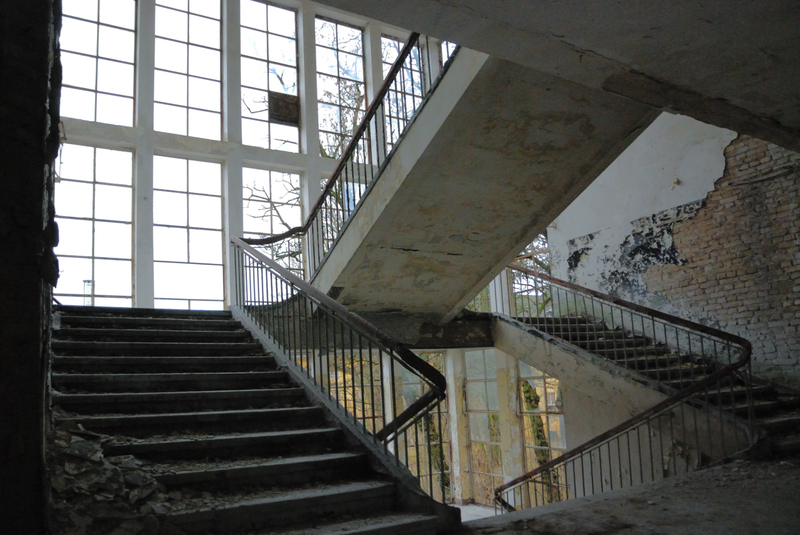 Jüterbog not only became home to the 32nd Guards Tank Division of the Soviet Army but also housed the elite academy of the Soviet Air Force, and counted with a small airport and several areas for military maneuvers and training. 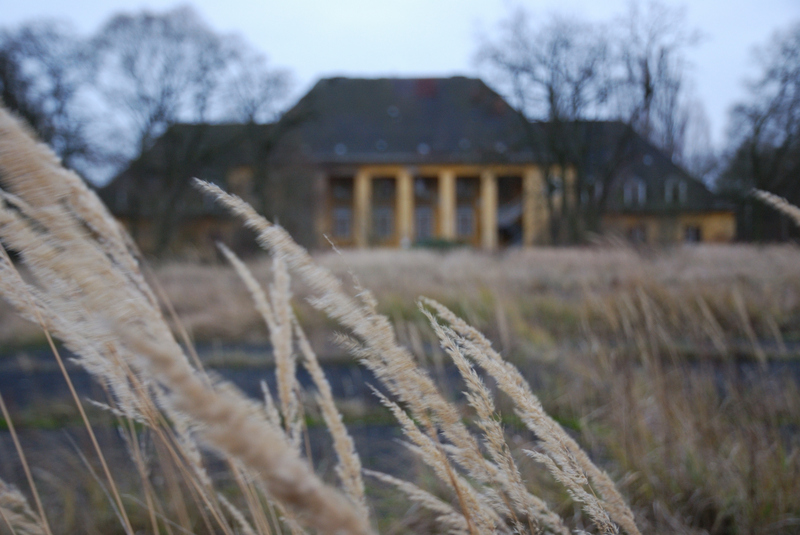 Rockets were stored here, and bombers and fighter jets called the hangars in Jüterbog home. 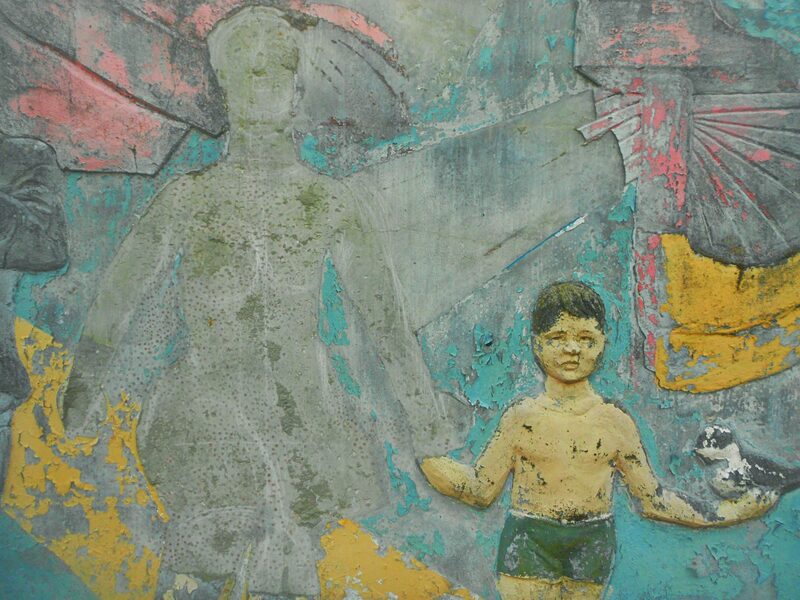 The Berlin Wall fell on November 9, 1989, and Germany was subsequently reunified on October 3, 1990. Following German Reunification, a plan was devised to bring the Soviet troops back to the Soviet Union—for their presence in Germany had become redundant. Just a little over a year after that, on December 26, 1991, the Soviet Union was dissolved—which meant that all of a sudden, the troops stationed in Germany were no longer “Soviet” but “Russian,” as the Russian Federation was declared to be the legal successor to the Soviet Union. 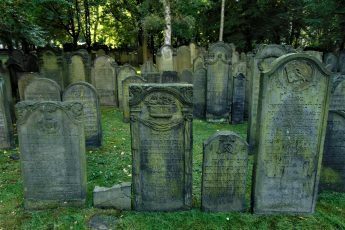 This means that, in the span of just a little over a year, the countries that these soldiers had sworn to defend with their lives simply vanished into the realms of history. These troops, which were now devoid of both enemy and mission, were to be withdrawn from the Federal Republic of Germany by 1994. By the time of German Reunification, there were ca. 340 000 soldiers stationed in the former East Germany. Added to these were ca. 210 000 family members. Thus, this process, which started in 1991, saw well over half a million people relocated from Germany to the Russian Federation. Many of them, especially career officers, had spent many years in Germany, and were now going “back” to a new country that didn’t have enough housing for the returning soldiers. Keep in mind that, added to the German troops, the Soviet Union had stationed soldiers in its other satellite states Poland, Hungary, and Czechoslovakia, with their numbers tallying in the several hundreds of thousands. And that’s not including the thousands of tons of material that needed to be transported. Jüterbog’s relevance ended with the withdrawal of the Soviet (later Russian) troops—over 30 000 men and their families. 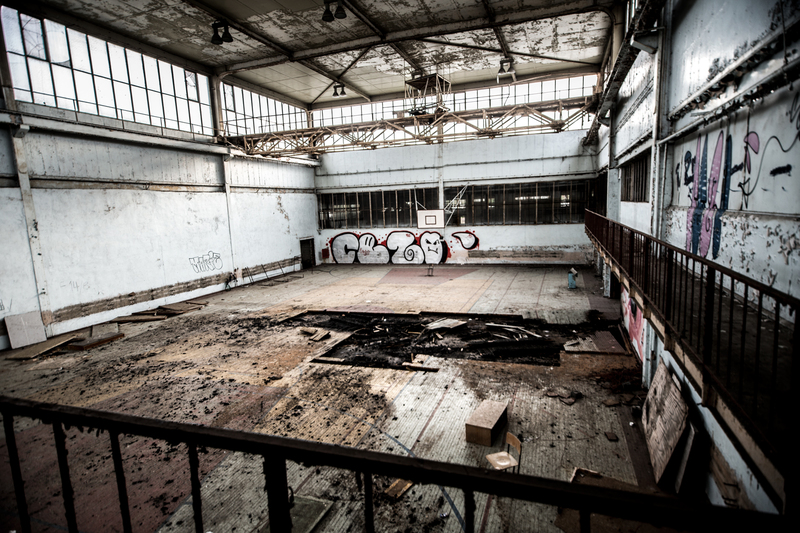 The withdrawing army left behind a host of bases that have been slowly succumbing to squalor and decay since 1994. 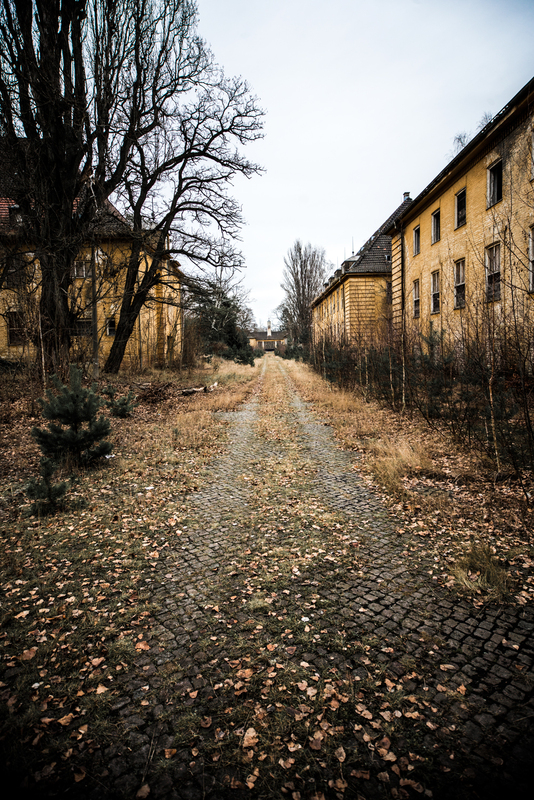 The only problem for the urban explorer is that they are rather far apart, with the Adolf Hitler barracks hidden in the middle of the forest north of the railroad tracks, and the old and new camps to the south of it. 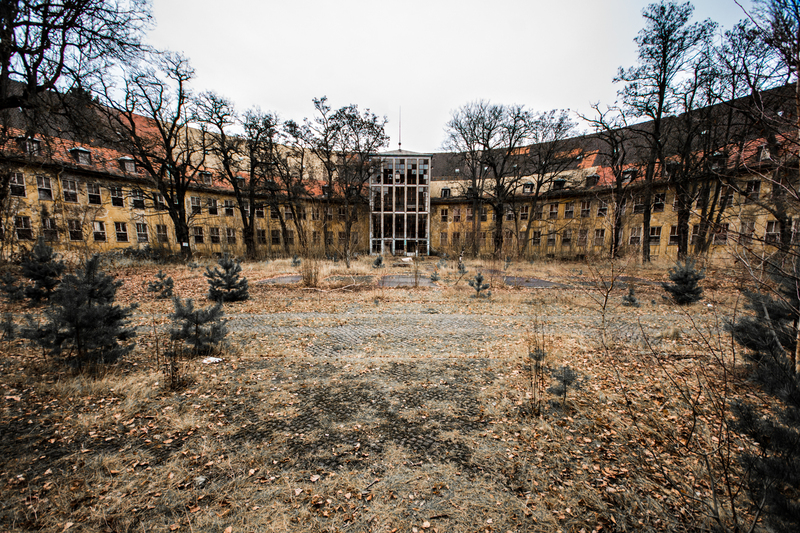 Since it’s winter right now, we knew we would only have time to really explore one of the complexes, and we decided that we would go for the Altes Lager (old camp). The Altes Lager is conveniently located by the train stop of the same name. 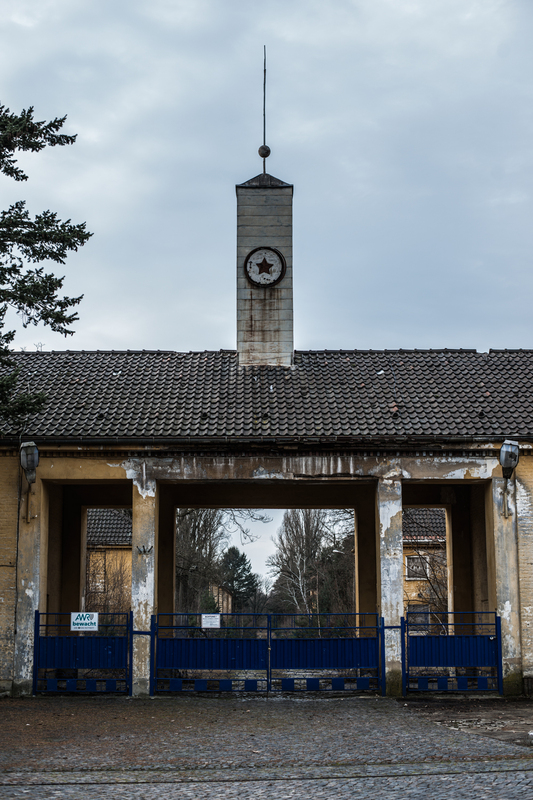 The architecture of the gate denotes German origins, but the rusting, once-red star on it lets the visitor know who last ran the place. We took a look at the gates of the building. In the distance we saw two black figures who we thought to be security guards, and thus decided to look for a different way in—which we found literally right around the corner, just past the fire station. The gray sky and the heavy clouds hovering above our heads accentuated the feeling of desolation in the base. It was quiet around, and we could hear the wind whistle through the overgrown weeds that now covered the once-tiled roads of the base. 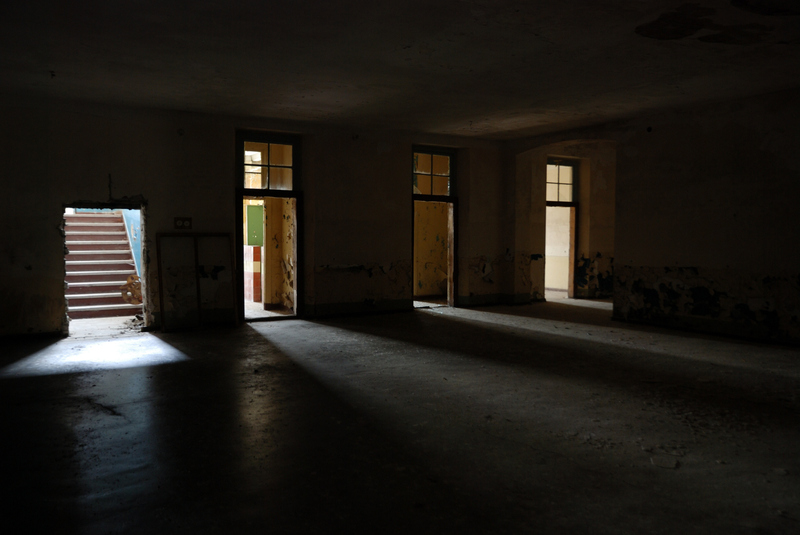 The first thing we came across was the husk of what seemed to be a warehouse. 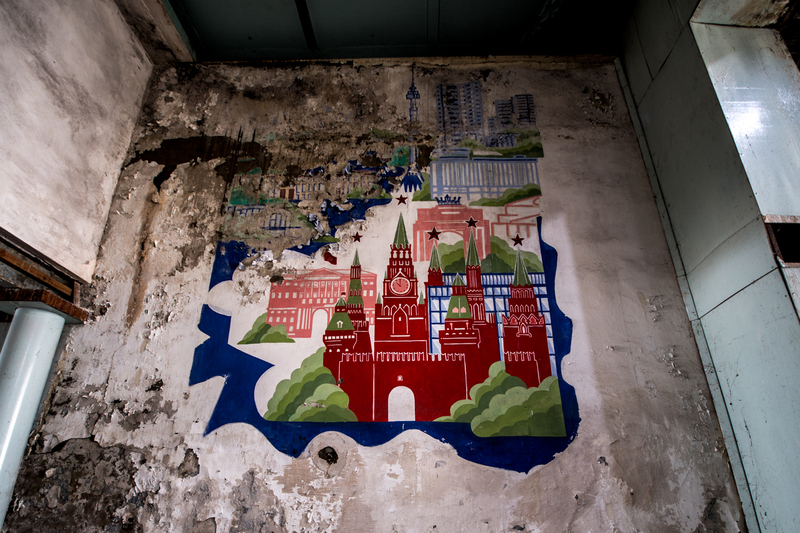 Inside, a mural with landmarks of Moscow and Berlin looked over the rotten wooden floors. Stale water dropped incessantly from the ceiling. The place stunk of moisture and housed a basketball court. We took a few pictures and continued our wandering. The base opened in front of us like the jaws of oblivion. The distances between buildings were immense, as they were all built around a massive bare-concrete square. So basically what we had in front of us was a huge void—a void lined with empty husks of buildings. Inside they were just as squalid and miserable. By the looks of it they were just regular barracks. Incidentally, one noticeable fact was that, unlike in Vogelsang or Krampnitz, the Altes Lager was almost completely devoid of political symbols—or so we thought until we entered the aviation school. 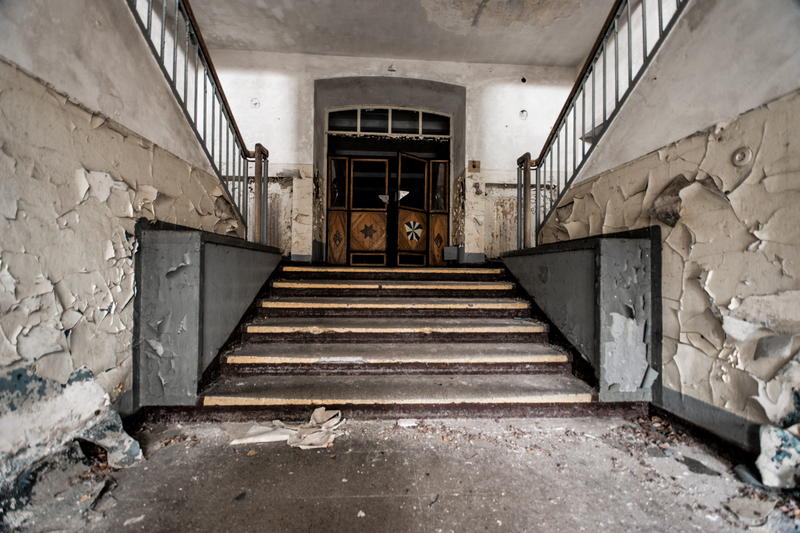 The school, tucked away on one end of the camp, was intimidating because of its sheer size. It was a moribund structure and we had to see its dying guts. We went in and were greeted by an ever-vigilant sentry. 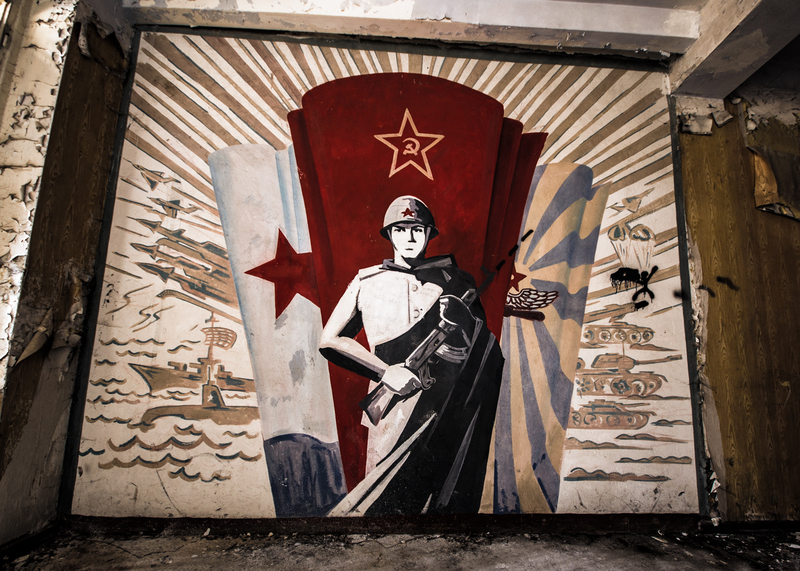 The mural was one of the best-preserved works of Soviet propaganda art I’ve ever seen. Flanked by the insignia of the navy and the air force, and guarding the standard of the Soviet Army, the sentry menacingly and zealously still defends the might of the Soviet Union. 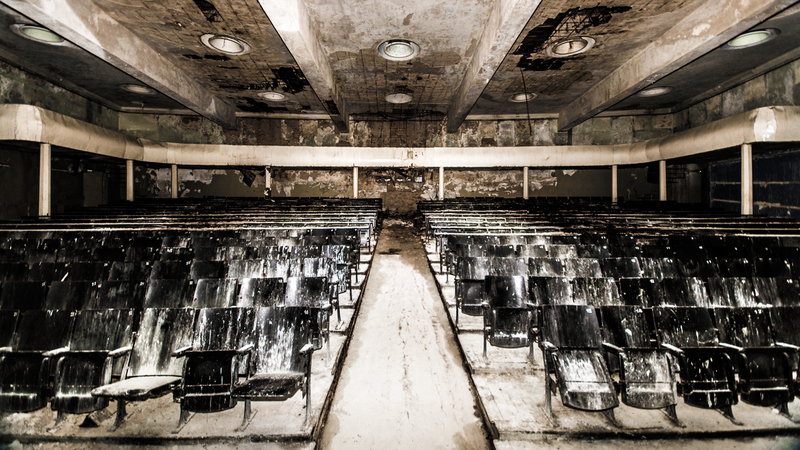 Behind the entrance was the main aula, a theater-like room overtaken by darkness. There’s something appalling about ruins, especially if they are all that’s left of buildings once erected to represent power. They embody temporality, and are a reminder that greatness crumbles and power fades. This realization is what lies beneath the remains of Jüterbog. Please leave a comment with your thoughts on this article below. If you liked it, please follow me on Facebook and Instagram. Likewise, please check out Ruben’s website, and follow Ruben Kindel Photography and Mi Wall Photography on Facebook. Oh, and don’t forget to subscribe to help Between Distances grow! Really enjoy your posts. We went to Berlin this past year but didn’t have time to explore any of the places you mention. This one seems to be relatively free of graffiti which gives it an even more timeless feel. Seb! This post is so cool! I envy the cool abandoned places near you! I’d love to visit that military base some day! Jazz! Thanks a lot for reading. Well, you know where to find me and I know how to find them. All you’ve got to do is fly to Berlin! Greetings from Ireland! Great writing again Seb! I have never heard of Jüterbog. What a fascinating town; perfect for urban exploration. How did you find out about this place? Cheers, man. I appreciate that. It’s such as good place for urban exploration. Gotta go back sometime soon. Just did a bit of research on the history of the Soviet Armed Forces in Germany and came across a map detailing all their positions. Fantastic! Great work – I’m always jealous when I’m not the first one to find out about places like this! Until I get over to Berlin again I’m happy to explore these places vicariously through your blog. I love the photos as well. I’m from auch small village right next to Jüterbog and I have never seen the places you have photographed. The pics are amazing. Now I will absolutely visit the places soon. Cheers, thanks a lot for reading. Glad you enjoyed it! Don’t forget to check out the other two articles. Just out of curiosity: How did you come across this post? Very interesting article and well researched. 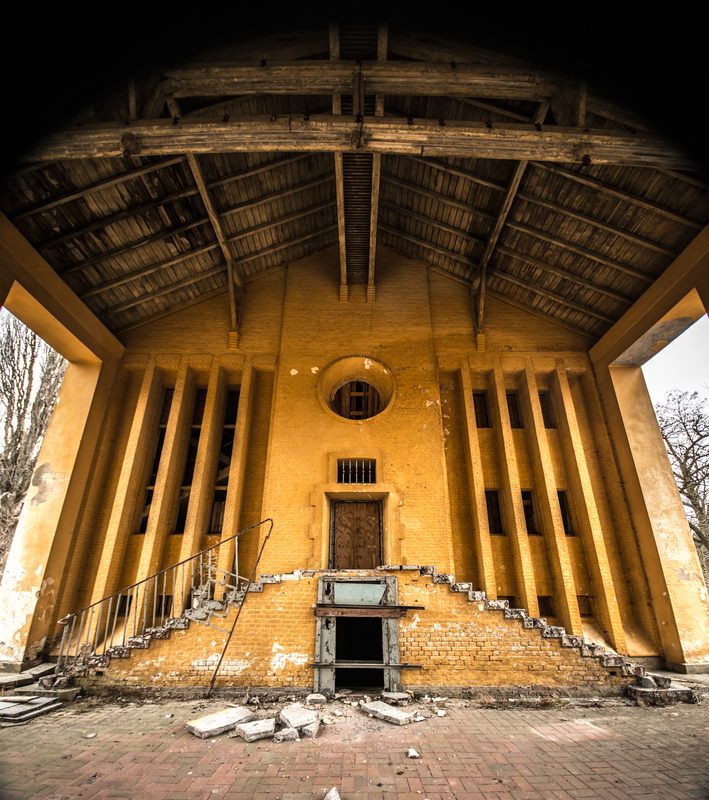 I have never heard of this place and its history before – although I lived in Berlin for a few years. Thank you for taking me on a little journey. V.
Yeah, there’s a few other bases near Berlin. I unfortunately only made it to three of them so I’ll have to go back there sometime soon! Nice shots and incredible story! I was therem but in Hospital/Sanatory. It was really creepy but so amazing feeling! It is very big area, and I am so sad I had no more time to explored this interesting part of history. I hope I will come back! Thanks a lot for your words. Glad you enjoyed the read! Same. I really want to go back there sooner than later! I am new to your blog and am completely absorbed into the posts. New fan that will look forward to new posts. Thanks so much for your comment, DeeDee! Glad to see that my articles are reaching the right audience. I appreciate your interest!